I’m from Virginia Beach where loyalties to local manufacturers run deep. In the Hampton Roads area we build warfare vessels (you know….the US Navy), we used to build Ford F150s, and we make Stihls. When it came time to invest in a chainsaw this Virginia Beach boy only had 1 option. My first Stihl chainsaw was the MS261C-Q. It is a 50cc saw with an 18″ bar and the “Q” means it has a chain brake on the rear handle too. I liked this extra safety precaution in my first saw. The only time that second brake is noticeable is during sharpening because you have to grab the rear handle when spinning the chain to the next tooth you want to file. With a table or stump vise it isn’t super annoying. Safety aside the 261 is an awesome saw. It wasn’t until after cutting with it for a year that I discovered how many 261 fans are on Arborist Site (mostly professional tree arborists). And I have to say I totally agree with the praise the pros have for this little saw. Maybe I shouldn’t use the “little” word as most home owners are far from needing a saw with the power of a small motorcycle. Not long after getting the 261 I ran into some maple that was ridiculously hard to buck. I thought something was wrong with my saw! That’s when I learned the term “concrete maple.” To this day that tree still holds the title of hardest log to cut. That maple inspired me to take the plunge into a saw that could easily spin a 24″ bar. The Stihl MS461R came home in mid-autumn 2014. The extra 26cc’s make a massive difference and the 3/8th chain rip through anything I’ve ever thrown at it. Like the 261 I happily discovered the notoriety of the 461 on Arborist Site too. 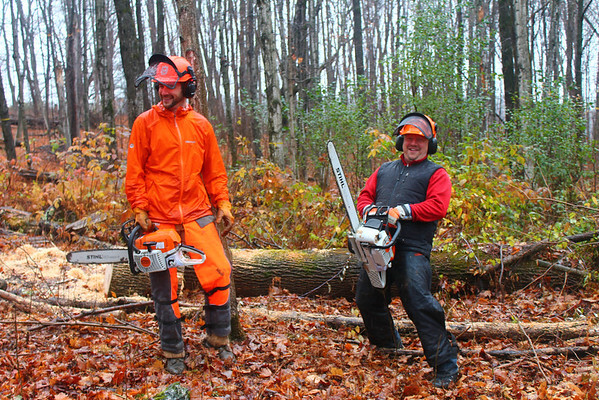 But the 461 is one of the most popular saws ever produced….not just compared against the Stihl lineup. Just yesterday a friend was helping me drop a trio of nasty hangers (a fallen tree with it’s canopy hung in another tree) with his Stihl MS250. Near the stump of the elder of the three hangers (the thickest one) it was difficult to gauge whether the tree was going to have top or bottom pressure upon cutting due to the contours of the land it had settled on. Sure enough my buddy found the pressure point with a stuck saw. So I grabbed the 261 and began to cut a wedge to de-pressure the tree enough for him to pull his saw out. There are few places where trees grow perfectly straight and those perfectly straight trees can always be cut on level ground or a man-made sawhorse. If that were the case one would only ever need 1 saw. I have yet to see a perfectly straight tree nor is the parts of my land I’m cutting on flat…..gotta get the trees out to level the land first! So, getting a saw stuck in unpredictable situations happens at least every other tree-cutting day. Fortunately, with two saws it is a fast remedy. Why such a long bar? I have met a few Vermonters in their 50s and 60s who have been cutting firewood their entire lives. They use a 16″ bar and borrow a larger saw in the extremely rare instance a need to fell a tree wider than 2 feet arises. When I tell them I’m using a 24″ bar they start laughing. When I tell them how I don’t have to bend over to buck a log they run out to the store to buy a bigger saw and 24″ bar. I guess I’m onto something. I’m a fair-weather sawyer, so I pretty much use the same stuff all year round. When the temperatures get under 20 degrees my outdoor activities are more about sliding down mountains. All that means is I’m not using Stihl’s blue gallon of bar oil. I stick to the orange containers and pair it with Stihl’s pre-mix. Yeah, this is absolutely more expensive than mixing your own small motor oil/fuel, but I have already saved $100 on one warranty issue. When using Stihl’s stuff your warranty runs longer. There are times when the saw gets stuck and material gets lodged between the chain and the bar. If I can’t clear it right away that saw gets a full chain removal and the bar is cleaned as much as I can clean it with hand tools. Unfortunately, this happens enough that I seem to be maintaining an excellent chain change/bar cleaning schedule. I have yet to see a need to do a full air filter cleaning in soap water. Occasionally I just pull the air filter out and blow on it then shake it a bit. That’s usually all that’s needed to remove over 90% of what’s accumulated on it. The 261 had a seal go bad once. It was leaking bar oil, so I took it into the shop and that was covered under warranty. The shop said the saw couldn’t have been maintained any better over the year I’ve had it. That saw had been through a few cases of fuel at that point, so it was definitely getting used. Comfort in tree size – trees are larger on the ground than they are in the air. I have yet to meet one that didn’t have a little extra canopy, height, or lean I didn’t see from the ground. Judging tree fall – which direction is this thing going to fall. Many times the weight of the branches overcomes the weight of the tree itself. And then there’s the hang-up factor where a tree falls onto another tree never reaching the ground. Comfort in fighting hangers – if the tree you are going to fell is not in the middle of an open field you’re going to have to worry about getting it hung on some sort of obstacle. This is supremely dangerous and potentially destructive. If you haven’t fought a hanger before you’re in for a rude awakening. It is the situation every feller fears most. Judging tree roll on the ground – once you have the tree down unseen obstacles come into play. A tree fall may have popped a rock up that the tree is now resting on. That rock may have created a back pressure point that you’re not going to find until you begin cutting the logs. This can either play out in a saw getting stuck or the freshly cut log rolling in a direction you weren’t anticipating. Knowing when you’re tired – we’re all human and need sleep. Using a chainsaw is fatiguing on its own, but pair that with dragging limbs or moving logs and you’re going to wear down quick. Just cutting and delimbing my first tree was enough to tire me out. I don’t even think I began bucking it into logs that first day. My body has conditioned to the activity and I can now run a good 6 hours straight without rest or food. I also recognize my fatigue as a lack of caring. When I start getting reckless I know it is time to stop. I don’t sense fatigue anymore. My muscles don’t scream like they used to. It is matter of bad judgement on my part that is my current indicator. Of course you need safety equipment to backup what your brain and body are doing. First and foremost: chainsaw chaps! I try not to cut without them. With the size saws I’m using the chaps are not going to stop a cut, but they may stop an amputation. Fortunately, I have yet to find out. Chainsaw chaps are leg protection that is filled with a material that will spool around the chain and chainsaw gears upon contact. Their job is to stop the saw. I don’t do any yard work without gloves. I like to keep my hands as clean and blister-free as possible. Unless you’re a total chainsaw jackass there isn’t a reason for that chain hitting your hands when cutting wood. In this instance the gloves can help calm the vibration transfer from the saw into your body. This helps lessen fatigue. But one should always wear gloves whenever he is going to touch the chain (sharpening, inspection, etc). The last time I sharpened without gloves I was very lucky to not need an emergency room visit. Things fall from the sky and things also roll. All of my work boots have composite or steel toes. I can’t imagine being dumb enough to work in my woods with tennis shoes. Even the simple chore of splitting wood in our hydraulic splitter is hazardous to one’s toes. And there also that thing above your neck called a head. Wrap it in a helmet when felling trees. Limbs don’t take nicely to new vibrations and there are windy days you might be working in. Eyes and ears weren’t made for chainsaws. Duh. My helmet has a face shield and ear muffs built into it, but I only wear the helmet when I’m cutting a tree down. When the tree is on the ground I find the helmet to be annoying, uncomfortable, and hot. I switch to screen safety glasses/goggles and separate ear protection. Whether you use glasses, googles, muffs, or ear plugs is totally a personal choice.